Gag photo of the second group of astronauts, 1962. That's Life photographer Ralph Morse in the back, next to Frank Borman. 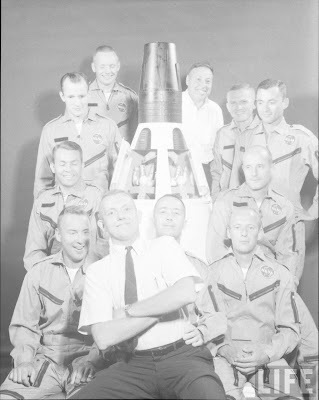 Unfortunately I don't know the name of the gentleman sitting on Jim McDivitt's lap; if you do, let us know. Starting from the top left and going counter-clockwise: Neil Armstrong, Ed White, Elliot See, Jim Lovell, unknown, Jim McDivitt, Pete Conrad, Tom Stafford, John Young, Frank Borman, Ralph Morse.